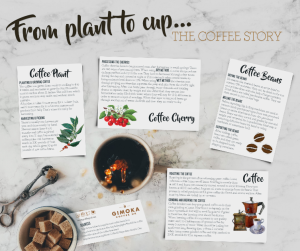 Jennifer’s Cakes has teamed up with Gimoka Coffee UK, to show you how coffee gets from the plant into your cup and even into your cakes. Take a look at this amazing post about the various processes that coffee beans go through in order to make the perfect brew. Coffee has become a breakfast staple for many people in different parts of the world. However, n ot many understand the journey this bean takes before it lands into their cup of coffee. From planting, through processing, to brewing, here is a complete coffee bean guide to give you an insight of what it takes to create that favourite cup of drink you cannot start your day without. You can also check out our infographic, which has some additional info on the Coffee blog. Coffee does well in tropical and subtropical climates. 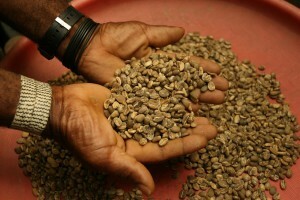 The bean, if not roasted and ground to prepare coffee, can be used as the seed that is planted to grow the coffee plant. The plant takes about 4 to 5 years to bear fruit, usually known as the coffee cherry. Generally, coffee production is a labor-intensive process, with most of the tasks done manually to prevent interference with the growth of the plant. You will find many labourers at different stages of coffee growing doing tasks such as planting, applying fertiliser, weeding, pruning, picking, sorting, among others. y appear dark orange or yellow during their peak ripeness. 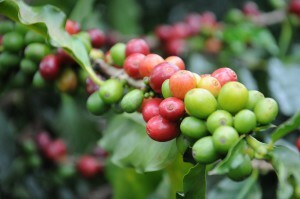 It is important for coffee beans to be harvested at their peak ripeness. This ensures quality and a rich flavor of the coffee brew. In most cases, coffee beans are selectively picked by hand. This way, harvesters will ensure only the ripe cherries are picked. Selective picking produces the finest variety of coffee beans. Some coffee growers, practice strip picking. In this harvesting process, machines can be employed to strip all the cherries from the coffee plant regardless of their maturity level. It is hard to get a consistent flavour profile from coffee beans harvested this way. After harvesting, the coffee beans undergo a rigorous process to produce the right bean for a perfect brew. To begin with, the cherries need to be husked and pulped to remove their outer cover and pulp, respectively. For the best quality, pulping should be done within 24 hours. There are two methods of coffee bean processing used today. Wet processing method begins by extracting the pulp and skin from the bean. The cherry is left only with the parchment skin when drying. After pulping, the cherries are fed into water channels, which sort them by size and weight. The ripe cherries are heavy and will sink whereas the lighter ones float making it easy to separate them. Next, the beans are put in fermentation tanks with water and left for about 12 to 48 hours. This helps break down the mucilage usually affixed to the parchment. The beans are rinsed and dried to a moisture content of 11%. It is a common method of processing applicable in areas where there is a limited supply of water. The process involves spreading the harvested cherries on a vast surface to dry under the sun. It is important to keep raking and turning the cherries during the process to make sure they dry evenly. Workers will cover them at night or in a rainy season to prevent the cherries from coming into contact with water. The process may take a couple of weeks before the cherries attain the desired moisture content of 11%. After processing, the cherries are taken through the milling stage to get a better product for sale. Here, the cherries are hulled, polished, sorted and graded. Hulling helps get rid of the parchment coat from the wet processed bean. For the dry processed cherries, hulling involves removing the dry husk. Sometimes, a silver coat remains after hulling and is removed through polishing. Beans are sorted according to their weight, size, shape, colour, and so forth. This process will also separate the perfect beans from those with certain imperfections. Sorting and grading could be done by machine or hand and is aimed at getting the finest grade of coffee beans for export. You would be startled to find out that even if the leading coffee consumers are in the industrialised countries, most growers are found in developing countries. Green coffee is packed in sisal bags or jute and loaded into shipping containers for export. Before roasting, a sample of coffee beans is traditionally tasted to ensure it’s of high quality. The process, usually known as cupping, takes place in a room customised for this task. The tasting stage does not only analyse coffee characteristics or defects but also identifies the best way to blend in order to get the perfect roast. Roasting will convert the green beans into the aromatic brown ones you purchase at your local café. It is paramount for freshly roasted beans to be consumed as soon as possible. Freshly roasted beans, a perfect grind, and a diligent brewing technique will guarantee a flavourful cup of coffee. As a coffee connoisseur, Rudy has always been aware of the vital role played by coffee in most people’s social life and he is especially active through the company’s social media and blog. He loves sharing his knowledge with readers around the world, writing and posting articles that range from the coffee brewing techniques to raising awareness of the importance of responsible production to help protect the rights of farmers and protect the environment.